Paris’s urban center is a large set piece that’s preened and preserved to look every bit like the City of Lights you see in the movies. Contemporary architects who break through have traditionally had to maneuver their modernist visions through strict building regulations, on everything from height to the angle of the roof pitch. 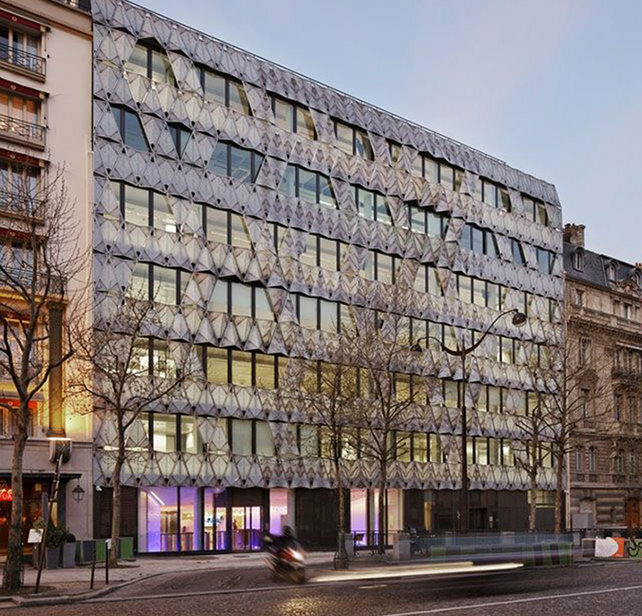 In the case of the “Origami” office building, it was the facade cladding that Manuelle Gautrand, the architect behind the project, had to defend. The building happens to be just off Place Charles de Gaulle, which means it stands in view of the Arc de Triomphe and other stately edifaces. “The location was challenging because of the proximity of many beloved buildings, and in a more general way the proximity of all the beautiful stone architecture made during Haussmann’s period,” Gautrand tells Co.Design. Her design for the building, she said, had to conform to the street’s policy of keeping a unified front. That is, the facade had to contain or incorporate sizable amounts of stone, a material that many of Gautrand’s contemporaries are not well versed in. But Gautrand, one of France’s best architects, has experienced similar constraints before. Her renovation of Paris’s famed Gaîté Lyrique theater, revamped as a center for digital art, saw the architect working deep inside the building. There, her intervention--a web of lasers, smoke, and sound--occupies the heart of the theater and is virtually invisible to the public outside. Conversely, the Origami office presents a lively addition to a well mannered, static street front. To meet the stone quotient, the architect and her office designed a marble exoskeleton that projects from a vertical glazed wall. The marble was cut extremely thin and mounted on triangular panes of glass, arranged in an origami-like composition that filters southern light while shielding office spaces from the street. The results are a lyrical interpretation of the building’s neighbors and, more generally, Haussmanian urbanism. Her buildings are unique in that they are linked together not by stylistic affinities but by the inventive touch she brings to each. The Origami office is evidence of that, transforming what could have been set in stone into a forward-looking triumph of contemporary architecture.